Thursday June 6 1907 I baked bread today. I cleaned the dining room closet and the boys put the big stove away. In afternoon I cleaned the pantry and took the tacks out of the carpet in our bed-room. In evening I answered a letter for Will to L. E Brown of [Deloran?]. Will put a new pump in north cistern. 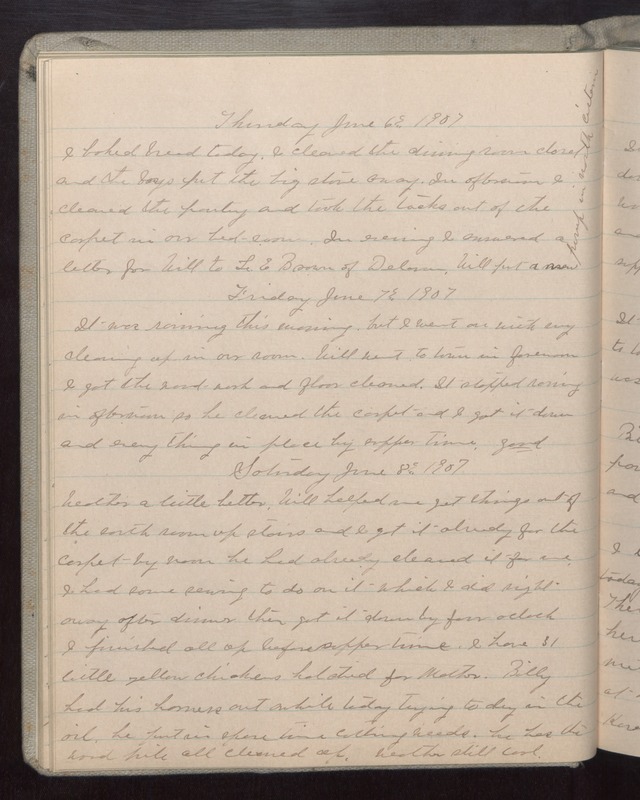 Friday June 7 1907 It was raining this morning but I went on with my cleaning in our room. Will went to town in forenoon I got the wood-work and floors cleaned. It stopped raining in afternoon so he cleaned the carpet and I got it down and every thing in place by supper time. good. Saturday June 8 1907 Weather a little better. Will helped me get things out of the north room up stairs and I got it already for the carpet by noon he had already cleaned it for me. I had some sewing to do on it which I did right away after dinner then got it done by four oclock. I finished all up before supper time. I have 31 little yellow chickens hatched for Mother. Billy had his [harness?] out awhile today trying to dry in the oil. he put in spare time cutting weeds. he has the wood pile all cleaned up. weather still cool.